When you're looking for high quality, discount lawn mower blades for sale online, RCPW has you covered. Our store carries more than 1.2 million replacement parts for all of your around the home power equipment and gear. 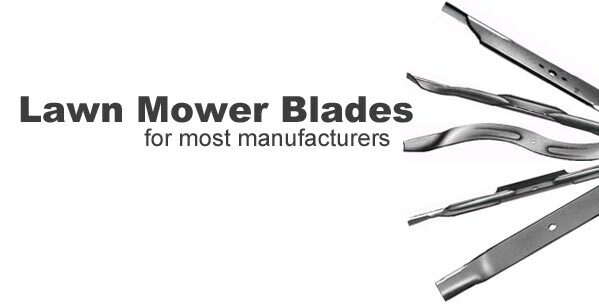 That includes a huge selection of lawnmower blades across all of the most well-known brands. A broken, bent, or damaged blade doesn't mean you need a new lawn mower. Just make sure you get the right replacement mower blades for your manufacturer, make, and model. Browse by brand or simply search your part number to get started. With a selection this huge, we always have the best mower blades for you, and we know you'll love our discount wholesale prices too. If you can't find what you're looking for, or you have any other questions, don't hesitate to call us at 800.937.7279, and we'll provide you with the assistance and lawn mower blades you need. Have your blade part number ready? Search for it above to find the replacement lawn mower blade you need! Whether you've got a postage stamp lawn or you're managing crews at a landscaping business, RCPW has the replacement blades for you. We carry replacement lawn mower blades for small equipment like push mowers and self propelled mowers all the way up to 72" commercial zero-turns or pull-behind mowers. The majority of blades are sold individually but a few brands such as Wheel Horse and Toro sell 2 or 3 packs of blades for their tractors. RCPW carries high quality high lift, low lift, medium lift, mulching, toothed mulching and Gator style blades. Buy your replacement blades from RCPW and save -- call our friendly staff today at 800-937-7279.